The post-apocalyptic subgenre continues to become more focused and down-to-earth with the passage of time, closing the gap between sensationalist sci-fi grit and relatable real-world drama. Based on the novel by Jean Hegland, Into the Forest takes another step further in that pursuit, focused on a pair of twenty-something sisters trapped in the outskirts of civilization during an inexplicable and debilitating power outage. Mansfield Park writer/director Patricia Rozema roots this quasi end-of-society scenario into a practical depiction of the descent into lawlessness, where arty, rustic photography tracks the pair of siblings as they encounter the complications of isolation without the necessities and creature comforts of electricity. 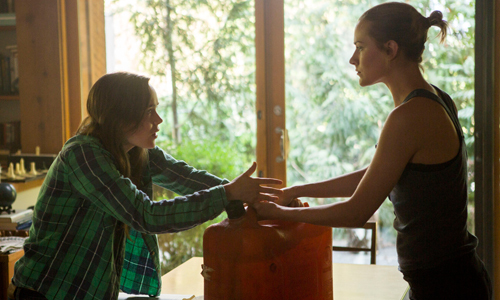 A pair of sympathetic performances from Ellen Page and Evan Rachel Wood intertwine with a conscientious outlook on sisterhood and anarchistic escalation, but Into the Forest veers off that earthy path due to overlapping circumstances and a tendency to bite off more expressive substance than it can chew. In a boxy, big-windowed house nestled somewhere in an unnamed mountainous area, two sisters -- Nell (Ellen Page) and Eva (Evan Rachel Wood)-- live with their father (Callum Keith Rennie) as they both near the culmination point in their career pursuits. Nell studies medicine, at times remotely through online courses; Eva persistently trains to become a professional dancer, fighting against her increasing age with a metronome ever clicking in the background. Both require electricity to keep on doing their thing, so it becomes a personal burden when a widespread power outage kills their video screens and music. The situation worsens, though, forcing Nell and Eva to care of themselves for the foreseeable future under these conditions. They're left to figure out how to make rations last and how to live with one another while keeping their frustrations under control ... and, while doing so, they also come face-to-face with the other dangers involved with the collapse of social structures. Into the Forest isn't concerned with the details of what caused the mass blackout that led to this quasi-dystopian setting, deliberately leaving Nell and Eva in the dark on the current state of the world beyond their family's ultra-modern house. Mild futuristic elements in technology -- transparent screens on computers and phones, commonplace solar-energy tech -- peg the events at some point in the near future, though, one of many details that the film allows its audience to infer through writer/director Patricia Rozema's spare, controlled perspective. There's subtlety like this throughout, both in the relationship within the sisters' family unit and how their troubles deepen in the woods, which makes it frustrating to see the script heavily rely on layers of circumstance to strand the daughters by themselves and inflame their problems. It's already suspect that a medical student and dancer elect to stay this far away from civilization, not to let forgetfulness, precisely-timed equipment malfunctions, and misplaced greediness be responsible for the direness of their scenario. Not unlike Z for Zachariah, Into the Forest pivots on choreographed developments to expand upon its more soul-searching motivations, rooting its end-of-the-world trials into a reflection on the bond between sisters. After depicting the crossroads that both Nell and Eva have reached in their studies and social lives, the story progressively illustrates what it means to have their everyday routines abruptly derailed by the widespread absence of power, challenging their will to continue their pursuits -- in Nell's case, also a relationship with local boy Eli (Max Minghella) -- against the halted state of society. Both actresses provide earthy, impassioned performances as the sisters; Ellen Page draws both full-throated empathy and scrappy fortitude out of Nell, while Evan Rachel Wood channels melancholy determination into Eva's metronome-fueled perseverance. Conflicts erupt over resources, safety, and the potential of thriving societies to the east of them, which are given depth and dimension by the somberness of the long road the sisters had endured prior. Within the increasingly rough conditions of the overgrown home and their dwindling stores, Into the Forest elevates their problems further the longer the sisters' isolation lasts, hallmarked by title cards that chalk up the days, weeks, and months alongside Nell and Eva's burdened personalities. Intensity builds over the lawlessness during the blackout, and the ensuing events allow the story to focus upon coping with post-trauma stress and the harrowing issues of being unseasoned -- yet abstractly prepared -- women in this setting. The dangers imposed upon them build slowly toward unsettling, albeit foreseeable and heavily foreshadowed peaks, yet they emphasize the starkness of unsettling drama and the boldness of what those circumstances entail above maintaining a level of growing suspense. Into the Forest tests the mettle of sisterhood through the thickest of circumstances, culminating into a well-acted but overstated portrait of survival, resourcefulness, and determination that stumbles while trying to say more than it needs to.